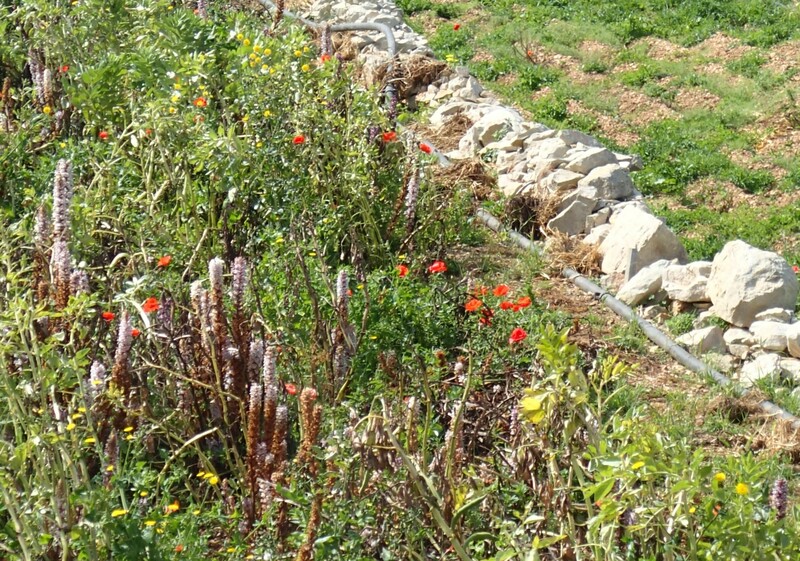 In ‘From Malta to Bowburn’ I looked at why legumes were so abundant on Malta but another plant group also seemed to be overrepresented – plants which are parasitic on other plants. These plants are another indicator of nutrient poor conditions. We saw two main types of parasite – broomrapes and dodder. Broomrapes attach themselves to the roots of their host plants whereas dodder attaches to the stem. Both are holoparasites, meaning they are completely dependent on their hosts for the organic material they need to grow, as well as for water and minerals. Many other plants are hemiparasites, able to photosynthesise to an extent but obtaining water and minerals from their host. Broomrapes (Orobanche) have their colourless leaves reduced to small scales, which lack chlorophyll. Without this pigment, they have no means of making their own sugars by photosynthesis and take everything they need from their host plant’s roots. Some broomrapes, such as O. minor in the UK, can parasitize a range of host plants whereas others are limited to specific hosts. Often hosts are members of the pea family because of their nitrogen fixing abilities and the strong tap root they usually produce. What struck me in Malta was the abundance of Orobanche plants on both waste ground and field margins – not something you would expect to see in the UK. 20 or 30 species of Orobanche are found in the Mediterranean area, particularly in calcareous coastal habitats such as that around the Dingli Cliffs on the south of Malta. Water and nutrients are scarce in the thin soil here. 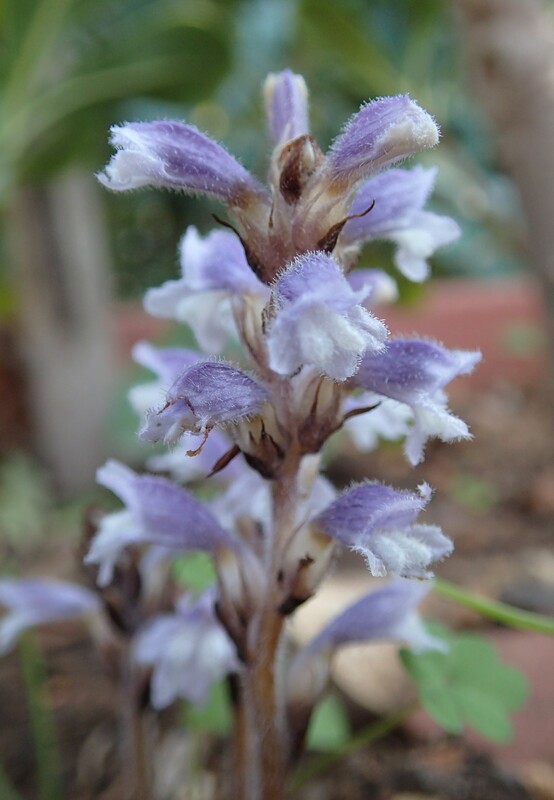 Broomrape seeds can remain dormant in the soil for many years until their germination is stimulated by secretions (of strigolactones) from the roots of an appropriate host plant. As they grow, broomrape seedlings produce root-like haustoria, which attach themselves to the host root and are able to extract water and nutrients from it by penetrating the plant’s vascular tissue. The parasite grows underground for a period of time before a flowering shoot emerges, which is the first we know of it. The flowers then produce abundant, long-lived seeds, allowing the parasite to bide its time until another suitable host is growing nearby. 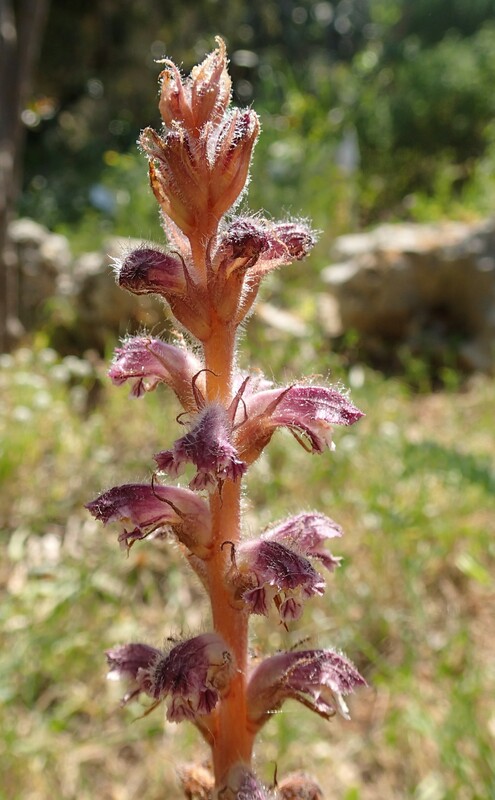 In southern Europe, broomrapes threaten crop plants by depriving them of a substantial portion of the water and organic materials they produce; branched broomrape (O. ramosa), for example, can damage crops such as tomatoes, potatoes and beans. In sub-Saharan Africa Striga, another root holoparasite after which strigolactones were named, causes huge damage to staple crops such as sorghum, maize and millet. Fascinatingly, the same strigolactones which allow Orobanche to grow are now known to be plant hormones responsible for regulating root growth and for ensuring that the mycorrhizal fungi on which many plants rely for acquiring mineral nutrients can successfully colonise the plant’s roots (see ‘A bit of a thing about Orchids’). This raises some interesting evolutionary questions about whether parasites or mycorrhizae were the first to make use of strigolactones! 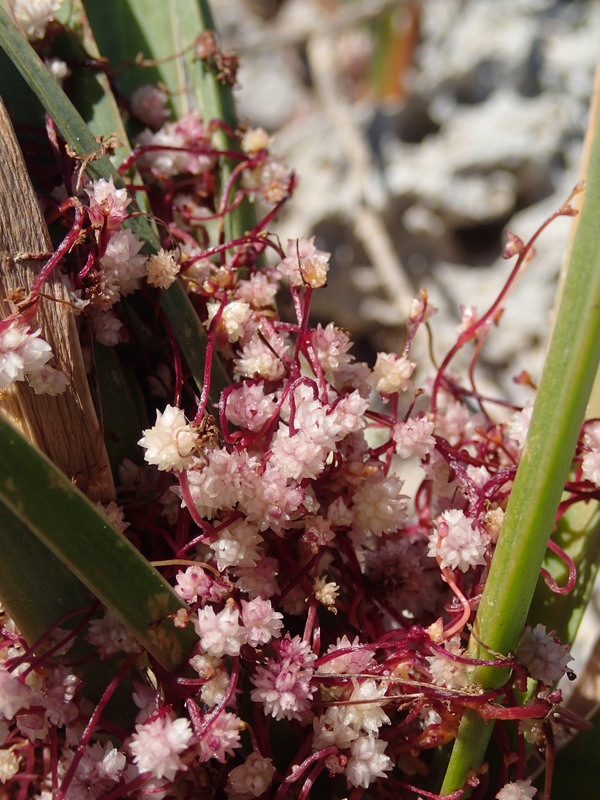 In contrast to broomrape, dodder (Cuscuta sp.) is a stem holoparasite. These plants are members of the Convolvulaceae or bindweed family and, like their relatives, are climbing plants. The reddish stems look like thread, tightly wound around the host leaves, and are bedecked with tiny pink flowers. Dodder has no roots or leaves of its own – the stem sends haustoria into the host’s vascular tissue at intervals to extract the water and nutrients it needs and the original root then dies. Stem parasites are much less closely integrated with their host’s life cycle than root parasites such as broomrape. Dodder seeds can germinate without a host and use volatile organic compounds released into the air by plants to track down a suitable host. An appropriate host has to be found within five to ten days, though, if the seedling is to survive to complete its life cycle properly. Like broomrape, dodder damages its host plants by stealing their hard won resources but it can cause further damage if attached to more than one plant by acting as a vector for the transmission of viruses between plants. Hairs on the surface of stems, as well as acting as a deterrent to herbivores, can make it more difficult for the dodder to attach itself, providing a degree of protection to the putative host. Perhaps it’s significant that the lily leaves on which saw dodder growing were smooth and shiny. Xie, X., Yoneyama, K. & Yoneyama, K. (2010). The Strigolactone Story. Annual Review of Phytopathology, 48, 93-117. This entry was posted in Uncategorized and tagged broomrape, Cuscata, Dingli Cliffs, Dodder, haustoria, hemiparasite, holoparasite, mycorrhiza, Orobanche, Strigolactones. Bookmark the permalink.